Although many beg to differ, people across the world today see America as a safe haven where they can venture to in order to fulfill their dreams. Even though more and more countries are developing quickly and the gap between developing countries and developed countries is getting smaller by the year, the United States is still unclear about its own immigration policy. A new development that will shake up immigration officers and lawmakers throughout the States is a hunger strike currently happening at the Northwest Detention Facility in Tacoma, WA, where between 750 and 1,200 people are protesting against deportations. Outside the facility, many activists had gathered in order to raise awareness and to support the strike. An attorney, who represents some of the strikers and wishes to be anonymous, said that the protesters want better food, better treatment, improved conditions and more money for the work they do, and that they will continue with the strike for five more days. Obama has continuously being slammed by rights groups for supporting the strict immigration policy – over 2 million people have been deported since he entered office, which has already broken records. 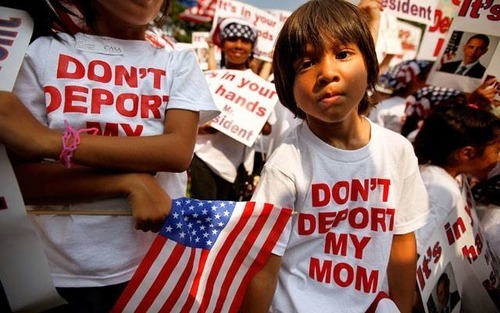 Janet Murguia, President of the National Council of La Raza (NCLR), has even gone so far to name him “Deporter-in-Chief“ in a speech at the NCLR’s annual Capital Awards dinner. “He can stop tearing families apart. He can stop throwing communities and businesses into chaos. He can stop turning a blind eye to the harm being done. He does have the power to stop this. Failure to act will be a shameful legacy for his presidency,” she said. President Obama however keep falling back on Congress, claiming that his hands are tied until lawmakers act, but reminding that he is „the champion-in-chief of comprehensive immigration reform“, and not someone to be blamed. Nevertheless, it is hard to set a bar that would determine whether immigration is good or bad, and why some immigrants should not be accepted while others should be, but, because of the diversity of nationalities that make up the US, it must not be taken for granted. Most Americans are proud of their origins and that legacy should be preserved through reformed but smart immigration policy.